March 7, 2019 (Phys.org) -- In a striking example of multi-mission astronomy, measurements from the NASA/ESA Hubble Space Telescope and the ESA Gaia mission have been combined to improve the estimate of the mass of our home galaxy the Milky Way: 1.5 trillion solar masses. The mass of the Milky Way is one of the most fundamental measurements astronomers can make about our galactic home. However, despite decades of intense effort, even the best available estimates of the Milky Way's mass disagree wildly. 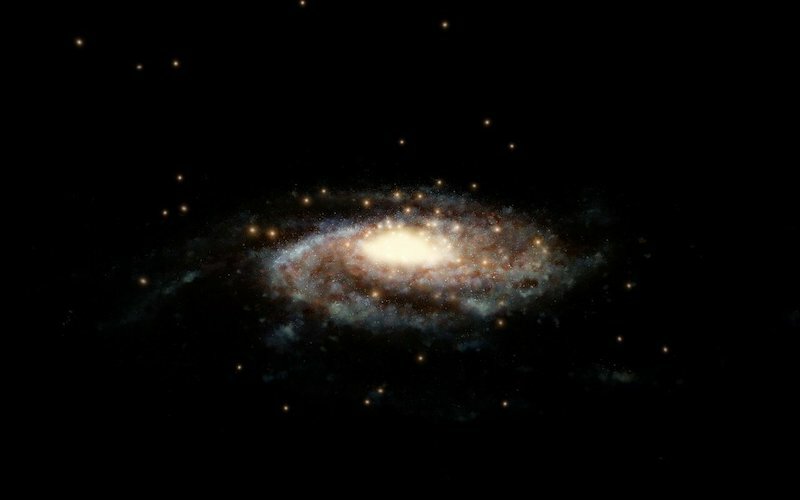 Now, by combining new data from the European Space Agency (ESA) Gaia mission with observations made with the NASA/ESA Hubble Space Telescope, astronomers have found that the Milky Way weighs in at about 1.5 trillion solar masses within a radius of 129,000 light-years from the galactic center. Previous estimates of the mass of the Milky way ranged from 500 billion to 3 trillion times the mass of the Sun. This huge uncertainty arose primarily from the different methods used for measuring the distribution of dark matter -- which makes up about 90 percernt of the mass of the galaxy. "We just can't detect dark matter directly," explains Laura Watkins (European Southern Observatory, Germany), who led the team performing the analysis. "That's what leads to the present uncertainty in the Milky Way's mass -- you can't measure accurately what you can't see!"